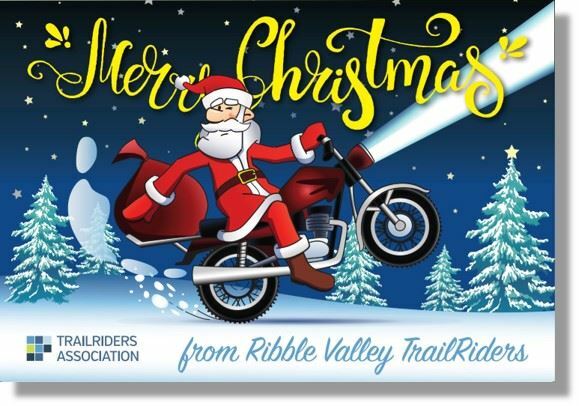 Ribble Valley TrailRiders are having a Charity Santa Run with all proceeds raised being donated to the NSPCC. With our help, the NSPCC can turn children’s lives around this Christmas. Carl Fogarty, MBE and patron of the TrailRiders Association will be joining us on this years ride. The route has yet to be finalised but is most likely to commence at Kettlewell, with an arranged lunch stop near Leyburn, over to Hawes and back to Kettlewell. We are asking for a £10 donation to take part (although not compulsory), and if you wish to donate more, then this will be greatly appreciated. 100% of all monies raised will go toward NSPCC. We will post more details of the route a little nearer the time, and details regarding trail riding etiquette. Due to the route, this is a ride for motorbikes only – note that quads will not be able to ride the route, due to the width of some of the lanes. Please check you diaries and pencil in the 16th December if you’re free.